The book is devoted to expanding current views on the phenomena of protein functionality in food systems. Protein functionalities in foods have been the object ofextensive research over the last thirty to forty years and significant progress has been made in understanding the mechanism and factors influencing the functionality of proteins. The functionality of proteins is one of the fastest developing fields in the studies of protein utilization in foods. Currently, a broad spectrum of data related to protein functionality in food systems has been collected, however, much more needs to be known. In this volume, the most important functional properties offood proteins are presented: Protein solubility, water holding capacity and fat binding, emulsifying, foaming, and gelling properties as affected by protein source, environmental factors (pH, temperature, ionic strength) and protein concentration; Relationships between protein conformation, physicochemical properties, and functional properties; Protein functional properties as influenced by various food processing conditions, particularly heat treatment, dehydration, freezing and storage when frozen, extraction and other processes; Effects ofprotein modification on the enhancementofprotein functionality; Utilization ofvarious proteins in improving functional properties in food systems. 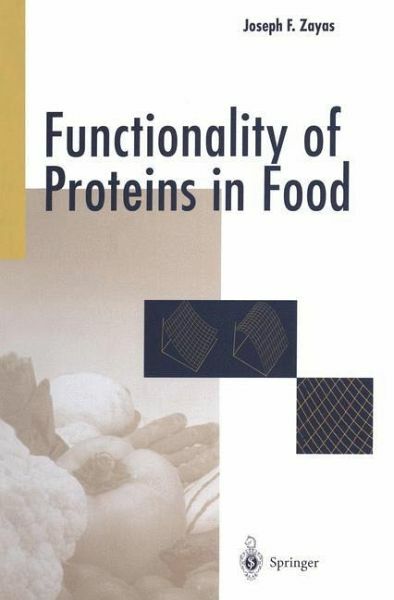 Those aspects of protein functionality are presented which the author believes to be interesting and most important for protein utilization in food systems. The book is recommended to students and food scientists engaged in food protein research and food industry research, and development scientists. Table ofContents Introduction 1 References 5 Chapter 1 Solubility ofProteins. . . . . . . . . . . . . . . . . . . . . . . . . . . . . . . . . . . . . . . . . . 6 1. 1 Introduction. . . . . . . . . . . . . . . . . . . . . . . . . . . . . . . . . . . . . . . . . . . . . . . . . . . . . . . . . . . . . 6 1. 1. 1 Factors Affecting Solubility ofProteins. . . . . . . . . . . . . . . . . . . . . . . .
1.1.1 Factors Affecting Solubility of Proteins. 1.2 Solubility of Meat and Fish Proteins. 1.2.1 Solubility of Muscle Proteins. 1.2.2 Solubility of Stroma Proteins. 1.2.3 Protein Solubility in Processed Meats. 1.2.4 Solubility of Blood Proteins. 1.2.5 The Effect of Heating on Solubility of Proteins. 1.2.6 The Effect of Freezing and Storage When Frozen on Protein Solubility. 1.2.7 The Effect of Protein Modification and Irradiation Treatment. 1.3 Solubility of Milk Proteins. 1.4 Solubility of Egg Proteins. 1.5 Solubility of Plant Proteins. 1.5.3 Pea and Bean Proteins. 2 Water Holding Capacity of Proteins. 2.2.1 Factors Influencing Water Binding of Proteins. 2.3 Water Holding Capacity of Proteins in Meat and Meat Products. 2.3.1 Water Binding Capacity of Muscle Proteins. 2.3.2 Factors Influencing Water Binding of Muscle Proteins. 2.3.3 Water Binding in Comminuted Meat Products. 2.3.4 Milk Proteins in Comminuted Meats. 2.3.5 Soy Proteins in Comminuted Meats. 2.3.6 Corn Germ Protein in Comminuted Meats. 2.4 Water Holding Capacity of Milk Proteins. 2.5 Water Holding Capacity of Egg Proteins. 2.6 Water Holding Capacity of Plant Proteins. 2.6.2 Pea and Bean Proteins. 3 Emulsifying Properties of Proteins. 3.2 Hydrophobic and Hydrophilic Properties of Proteins. 3.3 Interfacial Film Formation and Properties. 3.4 Factors Affecting the Emulsifying Properties of Proteins. 3.4.4 Heat Treatment and Other Factors. 3.7 Emulsifying Properties of Meat Proteins and Proteins Utilized as Extenders in Meat Products. 3.7.1 Protein Functionality in Comminuted Meats. 3.7.2 Emulsifying Properties of Various Muscular Proteins. 3.7.3 Emulsifying Properties of Blood Proteins. 3.8 Functionality of Nonmeat Proteins in Comminuted Meats. 3.8.3 Corn and Wheat Germ Proteins. 3.9 Milk Proteins as Emulsifiers in Food Systems. 3.9.1 Emulsifying Properties of Caseins and Caseinates. 3.9.2 Emulsifying Properties of Whey Proteins. 3.10 Emulsifying Properties of Egg Proteins. 3.11 Emulsifying Properties of Plant Proteins. 3.11.2 Pea and Bean Proteins. 4 Oil and Fat Binding Properties Of Proteins. 4.2 Fat Binding Properties of Proteins of Animal Origin. 4.2.2 Soy Proteins in Comminuted Meats. 4.2.3 The Effect of Corn Germ Protein Flour on Fat Binding in Ground Beef Patties. 4.2.4 Milk and Egg Proteins. 4.3 Fat Binding Properties of Proteins of Plant Origin. 4.3.2 Pea, Bean and Guar Proteins. 5 Foaming Properties of Proteins. 5.2 The Mechanism of Foam Formation. 5.2.1 Factors Affecting Foam Formation. 5.3.1 Factors Affecting the Foaming Properties of Milk Proteins. 5.4.1 The Effect of Processing on Foaming Properties of Egg Proteins. 5.5 Blood Proteins and Gelatin. 5.6 The Foaming Properties of Plant Proteins. 6 Gelling Properties of Proteins. 6.2 The Mechanism of Protein Gel Formation. 6.2.3 Factors Affecting the Properties of Gels. 6.3 Gelling Properties of Meat Proteins. 6.3.3 Gelation of Red and White Muscle Proteins. 6.3.4 Factors Affecting the Gelling Properties of Meat Proteins. 6.3.5 Myosin Blends with Other Proteins and Lipids. 6.4 Gelling Properties of Milk Proteins. 6.4.1 Gelling Properties of Whey Protein Concentrate, Isolate, and Individual hey Proteins. 6.4.2 The Effect of Heating and Protein Concentration. 6.4.4 Factors Affecting the Gelling Properties of Milk Proteins. 6.5 Gelling Properties of Egg Proteins. 6.5.1 Gelation of Egg White. 6.6 Gelling Properties of Soy Proteins.